VeitNamNet Bridge – Thousands of hectares of virgin forests have been destroyed in the mountainous areas of the central region and Central Highlands to give place for cassava fields. Cassava starch processing plants have been set up in many places since investors believe that the plants can bring fat profit. The mushroomed plants have prompted local residents to destroy the forests to have the land for growing cassava to provide to the starch processing plants. As a result, thousands of hectares of forests have been cleared because of the human’s cupidity. Summer days are considered “red days” for forest rangers, because the summer heat and dry weather may trigger cause fire at any times. However, under the scorching sun, mountainous residents still work hard. It’s now the time for them to clear trees for cultivation. A lot of households in the mountainous areas plan to grow cassava. The farm produce can bring the high turnover of tens of millions of dong or hundreds of millions of dong to every household a year. Therefore, local residents rush to grow cassava. As the land fund is limited, they try to chop down the trees in the forests to get land for cassava plantation. The Highway No. 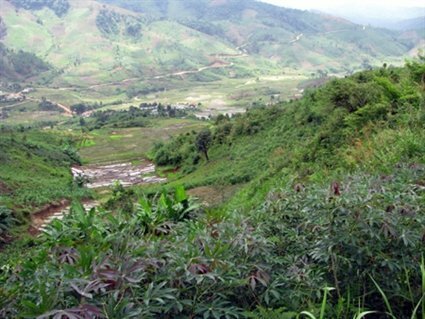 24 which runs across the Ba To mountainous district of Quang Ngai province, which was once full of the primeval forests, has become the “cassava center.” Those, who come to the area these days, would see the waterless cassava fields. If they go further to the districts of Dak To, Tu Mo Rong, Dak Glei in the northwest of Kon Tum, they would also meet again the cassava fields on the stiff mountainous slopes. A Phuc, Chair of Te Xang Commune People’s Committee in Tu Mo Rong district, said cassava is an easy growing plant which can be grown even in abrupt terrain. This is a kind of short term farm produce, which can bring high yield, while the plantation does not require much care because they do not have many insects. Therefore, cassava has become a good choice for local farmers. More and more farmers have chosen to grow cassava instead of other kinds of plants, especially since 2009, when a road linking Tu Mo ROng and the southern region of Quang Nam province was built. The road, stretching out for 200 kilometers on hill slope, has caused land slide, filling up many wet rice fields. As a result, local farmers have to go up further to the higher mountains, where they destroy the forests for cultivation. A Phuc has admitted that though the local authorities anticipate the bad consequences to be brought about by the afforestation; they have failed to stop the movement of chopping down trees to grow cassava. Local residents have been trying to chop down trees step by step and gradually encroach on the forest land. Therefore, it’s difficult for local authorities to discover and stop them. It is estimated that there are over 130,000 hectares of cassava in the Central Highlands. Gia Lai province is believed to have the largest area of cassava with over 50,000 hectares. Meanwhile, there are about 35,000 hectares in Kon Tum, 24,000 hectares in Dak Lak and 20,000 hectares in Dak Nong. Cassava has been provided not only to starch processing plants, but also to biofuel plants as well. With the high demand, the cassava sale price has been stably high, thus prompting people to develop cassava fields. Most recently, at a regular meeting, the Central Highlands Steering Committee gave warning to local authorities about the breaking of the material tree growing plans. The cassava growing area has increased by two folds, or triple, which also means that the growing area of other plants has decreased sharply. Especially, cassava has swallowed the forests, thus threatening to cause land erosion.